Summertime in Morocco is bright and sunny and, at times, very, very hot. 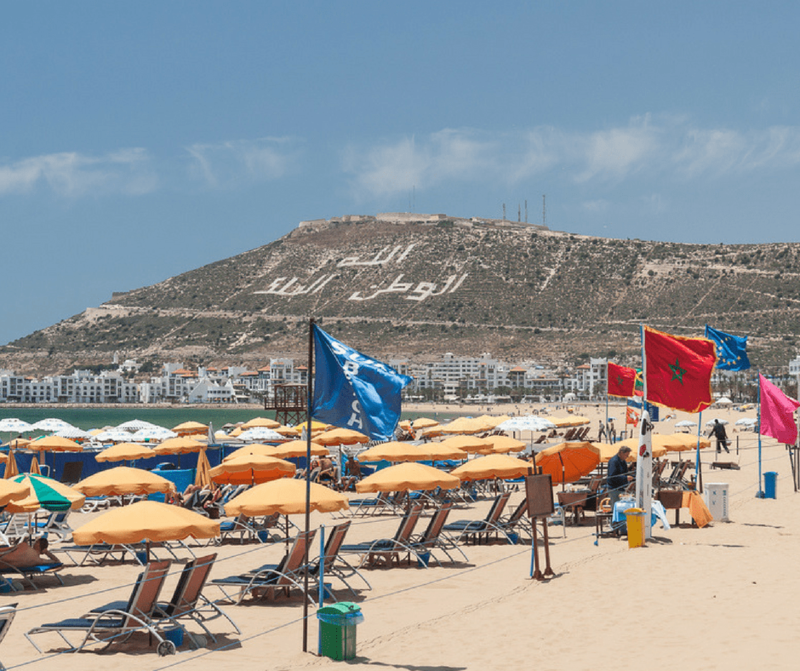 But while July might be the second hottest month of the year, it is also a popular time for vacationers looking for fun in that north African sun. Tourist traffic is high in July, and popular coastal cities can get quite crowded. Keep this in mind when making travel plans so you can book your preferred accommodations far enough in advance to guarantee your trip goes according to plan. July is not only one of the hottest months of the year in Morocco, it is also one of the driest. Keeping water with you is the best way to make sure you stay well-hydrated, so don’t be afraid to pack your favorite reusable water bottle. There are wonderful music and art festivals in Morocco in July, located in some of the cooler parts of the country. With so much to see and do, you might just be too busy to even notice the heat! For people who love the heat, July is a great time to visit Morocco. July is one of the two hottest months of the year (August is even hotter), with average temperatures of 29°C to 36°C most days. Evenings cool a bit when the sun goes down, averaging 18°C to 22°C degrees. The coolest daytime temperatures are found along the Mediterranean and Atlantic coastlines, as well as in the High Atlas mountains. If you are visiting any of the inland areas, be prepared for days to be hot and very dry, as there is little to no rain in summer in Morocco. It is good to keep the heat in mind when choosing lodging, as well, as many places do not have air conditioning. The most challenging thing about dressing for Morocco in July is thinking of ways to stay cool while also staying reasonably covered. If you are visiting one of the bigger cities with a lot of tourist traffic, you may feel comfortable in sleeveless shirts and shorts. But generally speaking, you will invite less unwanted attention if you keep your shoulders and knees covered. Loose clothing and breathable fabrics like cotton make it easier to stay cool, even while staying reasonably covered. Long shorts and skirts are great, and loose fitting, wide-legged slacks are a comfortable choice, too. 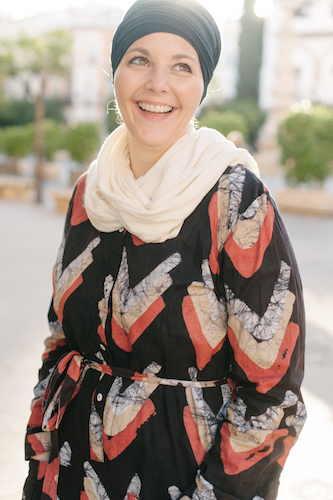 If you can’t resist taking along your favorite sleeveless shirts, consider pairing them with long, loose tunics or shirts that cover your shoulders and bottom. A nice large brimmed hat is a great way to keep the sun out of your eyes, and sunglasses are a must-have, as well. And with all the walking you’ll want to do, make sure you have some supportive and comfortable walking shoes or sandals. Some scarves in light and airy fabric can be a stylish and welcome addition to many outfits, as well. (Date Varies) – Timitar Music Festival – Held in the beautiful Atlantic coastal city of Agadir, the Timitar Music Festival is one of the largest festivals in Morocco. 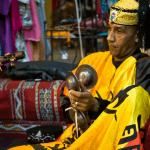 Founded in 2004, this annual four-day event is all about uniting people through music and celebrating the Amazigh culture. Over 800,000 people attend this incredible event, so be sure to make your plans early if you would like to be one of them! (Date Varies) – International Cultural Festival – The lovely coastal town of Asilah is a haven for artists. This walled city is beautifully painted with incredible murals, celebrating art and heritage. During the annual International Cultural Festival, artists from all around the world come together to transform public areas of town with amazing works of art. If you love art, this incredible two-week event is a once-in-a-lifetime experience! (Date Varies…held in July in 2016 but in August in 2017)Alegria</B> – The Festival of Alegria takes place in the beautiful blue city of Chefchaouen, two hours southeast of Tangier. The festival was established in 2004 and is a wonderful way of bringing people together to celebrate cultural diversity and art through music and other creative expressions. Ultimately, the mission of Alegra is to bring together the cultures of Africa, Latin America, and the southern Mediterranean. Be sure to check dates so you don’t miss out on this amazing two-day event! event to enjoy during your Moroccan vacation! Finding ways to enjoy the sights while staying cool is the name of the game in July in Morocco. Inland locations may be uncomfortably hot, but the coastal cities stay cooler with refreshing ocean breezes, making them a popular location for tourists. There are numerous festivals to enjoy in July, especially for those who love music and art. And remember that no matter where you go, most things happen after the sun goes down. Cities may be very quiet during the day, but at night you will see food stalls and musicians and wonderful handmade items perfect for gift giving and souvenirs. Whatever your destination, look for museums, art galleries, and other indoor locations where you can find shade from the sun. And if you really want to get out in nature, consider a trip up into the Atlas mountains, where you’ll get the added bonus of cooler temperatures, as well! The beautiful, busy city of Agadir is considered the capital of the south of Morocco. Much of the city was leveled in 1960 during a very bad earthquake, so it is one of the most modern cities in Morocco. Known for stunning beaches and lovely ocean breezes, Agadir is a popular Moroccan destination in July. It is also the home of the Timitar Music Festival, an annual event every July. One of the few places in the city that survived the 1960 earthquake is the Kasbah. If the heat of the day isn’t too much, hiking to the old Kasbah is a wonderful experience. Not only are the views of the city amazing from the Kasbah, the medieval Arabic architecture is a feast for the eyes! Another wonderful place to explore is La Medina d’Agadir. This beautiful place was constructed in 1992. It is a life-size re-creation of the city’s original medina, which was destroyed in the 1960 earthquake. 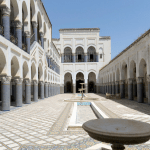 It is a great place to find some shade and a bit of a breeze while taking in the stunning traditional Berber building techniques and learning more about the history of Agadir. 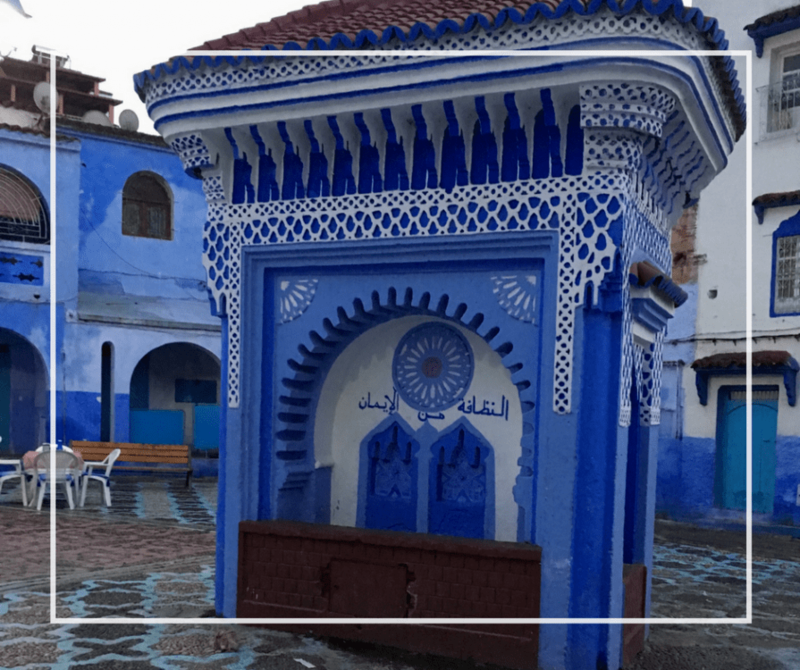 The tranquil and beautiful town of Asilah is a dream destination for many artists and art lovers alike. Home of the yearly International Cultural Festival, many of the walls in the public areas around town are painted with beautiful murals. This Atlantic Coastal city is a great place to relax and enjoy some peace from the hustle and bustle of the larger cities while cooling off in the ocean breeze. If the beach is calling your name, take a taxi out to the beautiful Paradise Beach. Filled with soft sand and privacy, it is easy to find a secluded spot to relax for a while, enjoying the fresh salty air and rhythmic ocean waves. Asilah is small enough that you can walk around the entire town in a day. As you wander through this lovely walled town, make sure you allow time to see the Ramparts, which were built in the 15th century when Asilah was under Portuguese control. Another wonderful bit of history is the El-Hamra Tower which dates back to the same time frame as the Ramparts. Considered one of the most beautiful locations in Morocco, the holy city of Chefchaouen is home to the yearly Festival of Alegria. If you are able to be in town for this amazing event, make sure you leave time to explore a bit more of the fun this enchanting town has to offer. 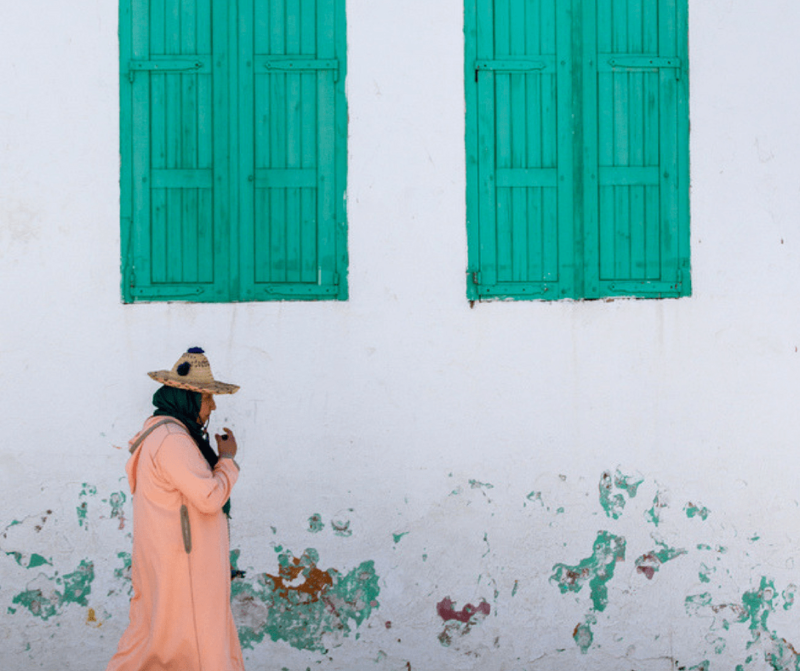 Spend some time exploring the winding paths of the lovely blue and white-walled medina. In the center, you will find a stunning Andalusian garden, which is the setting of the Chefchaouen Ethnographic Museum. Filled with astounding collections of embroidery, pottery, musical instruments, and art from all over northern Morocco, it is also a great way to escape the hot July sun. If you are in the mood for a walk in nature, head out to the Cascades d’Akchour, a beautiful waterfall approximately 30 minutes out of town. A friendly walking trail leads you there, and the natural beauty of the area is a visual feast. And if all that walking makes you feel too hot, there are some inviting pools of water among the rocks where you can cool off! Just a bit south of Asilah, the Atlantic coastal city of Larache is another great place to escape the heavier crowds in the bigger cities while enjoying that cool and refreshing ocean breeze. Larache was ruled by Spain from 1610 to 1689 and again from 1912 to 1956, and features gardens, orchards, and stunning architecture. No visit to this lovely walled city would be complete without a visit to the medina. Although the medina is mostly residential, there is a large market where you can find fresh seasonal produce and more. The medina is also home to the Galerie Lafnar, an art gallery located in an old wheat rooming house. Enjoy exhibits of the work of both local and international artists while taking a break from that hot north African sun. Although it is closed to the public, fans of architecture should be on the lookout for the Music Conservatory. The stunning building is rich in Hispano-Moorish architectural features, including a minaret-style clock tower and ornate balconies. With heavy tourist traffic and hot summer sun, visiting Morocco in July can be a bit challenging. But with so many wonderful festivals to enjoy and cities to explore, July may just be the perfect time to enjoy your Moroccan dream vacation!